Wow, did I seriously go the whole month of October without posting anything? It's after midnight in Shanghai on November 1. October was crazy busy, but all good. We went to Hong Kong, we had a guest from the States, and I've been furiously writing a Christmas production script. No time for newsy updates! Even this won't be long. Gotta wrap it up before I turn into a pumpkin. But in honor of Halloween (which is still going on in the States), I have two things to mention. Both involve the kids. First, my sons go to a Chinese school. Not an international school, but a Chinese school with a bilingual track. A couple of their classes are taught fully in Mandarin, including art, computer science, and PE. There are 3000 students at the school, and the campus is huge and simply gorgeous. My sons are the only Caucasian children at the school, which is predominately Asian with a minority of students from African countries. I'm sure I'll write more about our crazy education choices, but that's the background. Last week my son Ben, age 11, was asked to give a speech to the whole school on "Halloween in America." I found this somewhat hilarious, as Ben only participated in any type of Halloween activities in America maybe once or twice, and it would have been over four years ago. But as the token white kid (he is not the only American), he was perceived as the expert on the topic. I am very proud of him though! He said he mixed up a couple of things, like pointing at a mask and calling it a pumpkin, and vice versa, but otherwise he was very confident and bold in speaking. Yay Ben! 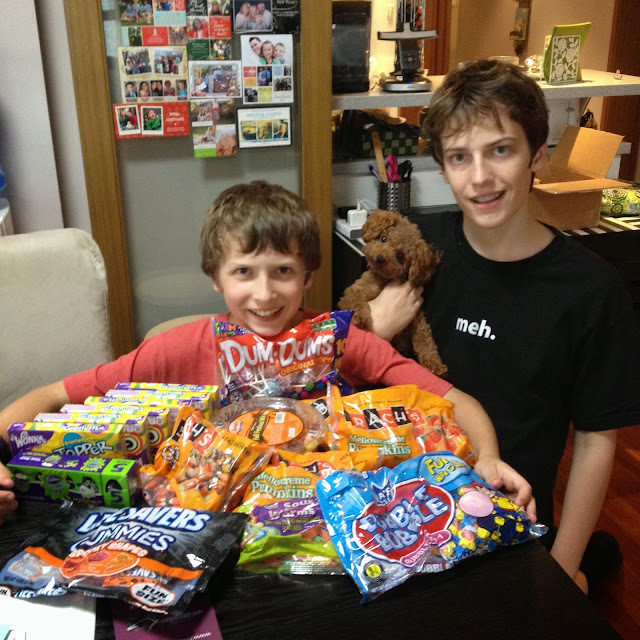 Second, my parents spent a fortune (over $80 USD) to mail us a huge box of Halloween candy, which arrived the day before Halloween (while I was talking on the phone to them!). Since the customs declaration form plastered to the outside of the box clearly stated "Halloween Candy" on it, I waited until they got home from school on Friday to rip into it. It was a super sweet treat. The boys have actually gone Trick or Treating here in Shanghai, but this year we all stayed in, snacking on the American candy and watching a double feature of Edward Scissorhands and Nightmare Before Christmas, both Tim Burton films with scores by Danny Elfman. We recently introduced the boys to Beetlejuice as well. It's fun to watch them discover a filmmaker's signature style! The dentist is going to love us! Thanks Mom and Dad! Your cute little pooch makes me smile with every picture. If I could get a little dog that looked exactly like her, I think I would!